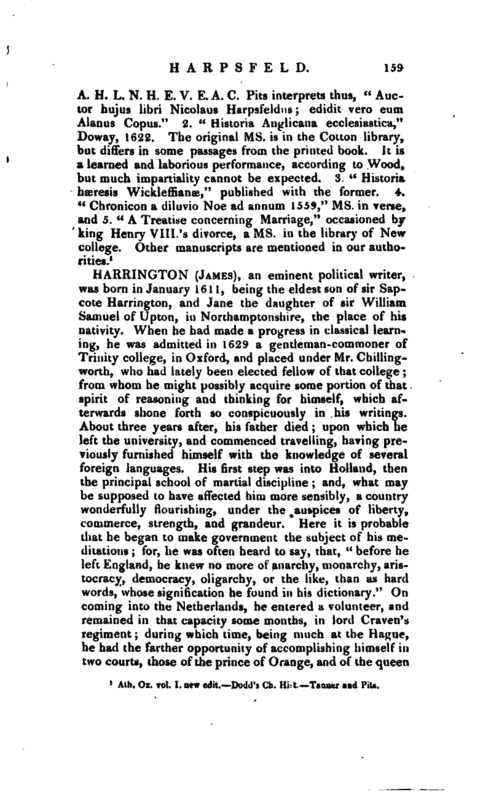 , an eminent political writer, was born in January 1611, being the eldest son of sir Sapcote Harrington, and Jane the daughter of sir William Samuel of Upton, in Northamptonshire, the place of his nativity. When he had made a progress in classical learning, he was admitted in 1629 a gentleman-commoner of Trinity college, in Oxford, and placed under Mr. Chillingworth, who had lately been elected fellow of that college; from whom he might possibly acquire some portion of that spirit of reasoning and thinking for himself, which afterwards shone forth so conspicuously in his writings. About three years after, his father died; upon which he left the university, and commenced travelling, having previously furnished himself with the knowledge of several foreign languages. His first step was into Holland, then the principal school of martial discipline; and, what may be supposed to have affected him more sensibly, a country wonderfully flourishing, under the auspices of liberty, commerce, strength, and grandeur. Here it is probable that he began to make government the subject of his meditations; for, he was often heard to say, that, “before he left England, he knew no more of anarchy, monarchy, aristocracy, democracy, oligarchy, or the like, than as hard words, whose signification he found in his dictionary.” On coming into the Netherlands, he entered a volunteer, and remained in that capacity some months, in lord Craven’s regiment; during which time, being much at the Hague, he had the farther opportunity of accomplishing himself in two courts, those of the prince of Orange, and of the queen | of Bohemia, daughter of our James I. who was then a fugitive in Holland. He was taken into great favour by this princess, and also by the prince elector, whom he attended to Copenhagen, when his highness paid a visit to the king of Denmark; and, after his return from travelling, was entrusted by him with the affairs of the Palatinate, so far as they were transacted at the British court. He stayed, however, but a short time in Holland; no temptations or offers could divert or restrain him from the resolution he had formed to pursue his travels, and therefore, taking Flanders in his way, he set out on a tour through part of Germany, France, and Italy. While he was at Rome, the pope performed the ceremony of consecrating wax-lights on Candlemas-day. When his holiness had sanctified these torches, they were distributed among the people, who fought for them very eagerly. Harrington was desirous to have one of them; but, perceiving that it was not to be obtained without kissing the pope’s toe, he declined to accept it on such a condition. His companions were not so scrupulous, and when they came home spoke of his squeamishness to the king. The king told him, “he might have done it only as a piece of respect to a temporal prince;” but Harrington replied, that “since he had the honour to kiss his majesty’s hand, he thought it beneath him to kiss any other prince’s foot.” He is said to have preferred Venice to all other places in Italy, as he did its government to that of the whole world; it being, in his opinion, immutable by any external or internal causes, and to finish only with mankind. Here he cultivated an acquaintance with all the men of letters, and furnished himself with the most valuable books in the Italian tongue, such especially as were written upon politics and government. After having thus seen Italy, France, the Low Countries, Denmark, and some parts of Germany, he returned home to England, and in the beginning of the civil war, 1642, he took a decided part with the parliament, and endeavoured to get a seat in the house, but could not. His in, clmation to letters kept him from seeking public employments, so that we hear no more of him till 1646; when attending out of curiosity the commissioners appointed by parliament to Charles I. from Newcastle nearer to London, he was by some of them named to wait on his majesty, as a person known to him before, and engaged to no party or | faction. The king approved the proposal, and Harrington, entered on the station of a domestic; but would never presume to come into his presence, except in public, till he was particularly commanded by the king, and made one of the grooms of the bed-chamber in May 1647. He had the good fortune to please the king much: “His majesty loved his company,” says Wood, “and, finding him to be an ingenious man, chose rather to converse with him than, with others of his chamber. 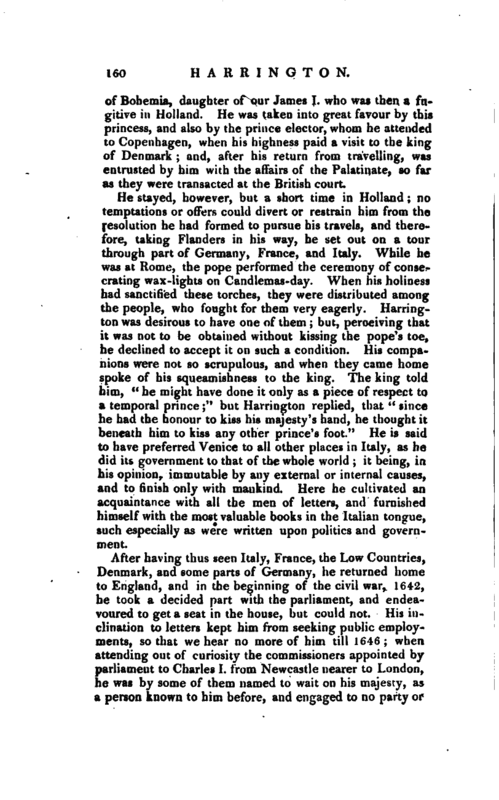 They had often;” says he, “discourses concerning government; but, when they happened to talk of a commonwealth, the king seemed not to endure it.” Harrington conceived a high notion of the king, finding him to be a different person from what he had been represented, as to parts, morals, religion, &c. and therefore, after the king was removed out of the Isle of Wight to Hurst-castle, in Hampshire, was forcibly turned out of his service, because he vindicated some of his majesty’s arguments against the parliament commissioners at Newport, and thought his concessions more satisfactory than they did. There is no ground to imagine that he saw the king any more till the day he was brought to the scaffold; whither Harrington found means to accompany him, and where, or a little before, he received a token of hifcmajesty’s affection. The king’s execution affected him extremely. He often said, ft nothing ever went nearer him; and that his grief on that account was so great as to bring a disorder upon him." 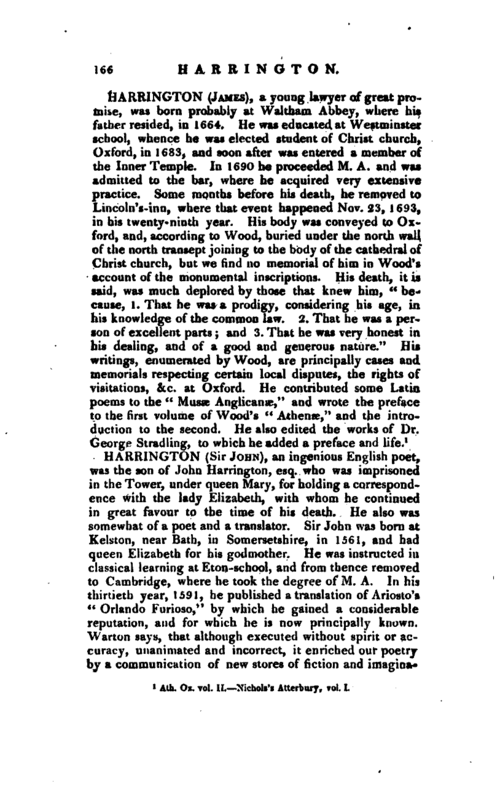 For this and many other particulars respecting Mr. Harrington, Wood appears to be indebted to the Aubrey Mss, now published in “Letters writ­ ten by Eminent Persons, &c.” 1813, 3 vols. 8vo. There is in tlu-se Mss. a more minute account of Harrington’s insanity. After the restoration, he lived more privately than he had done before, but still was looked upon as a dangerous person, who maintained and propagated principles which could never be reconciled to monarchical government. He employed himself now in reducing his politics into short and easy aphorisms methodically digested, and freely communicated his papers to all who visited him. While he was putting the last hand to his system, he was, by an order from the king, seized December 28, 1661, and committed to the Tower of London for treasonable designs and practices. 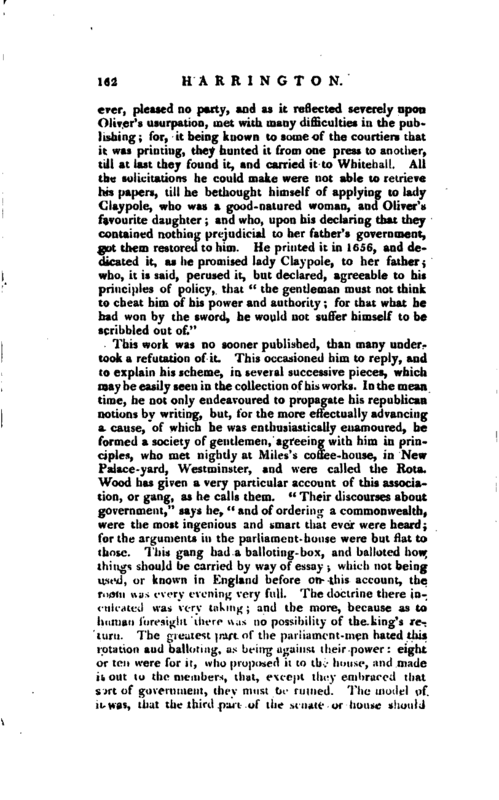 He was charged by lord chancellor Hyde, at a conference of the lords and commons, with being concerned in a plot, of which twenty-one persons were the chief managers “that they all met in Bow-street, Coventgarden, and in other places that they were of seven different parties or interests, as three for the commonwealth, three for the long-parliament, three for the city, three for the purchasers, three for the disbanded army, three for the independents, and three for the fifth-monarchy men; that their first consideration was how to agree on the choice of parliament-men against the ensuing session; and that a special care ought to be had about the members for the city of London, as a precedent for the rest of the kingdom to follow; whereupon they nominated the four members after chosen, and then sitting in parliament. Their next care was to frame a petition to the parliament for a preaching ministry; and liberty of conscience; then they were to divide and subdivide themselves into several councils and committees, for the better carrying on their business by themselves or their agents and accomplices all over the | kingdom. In these meetings Harrington was said to be often in the chair;. 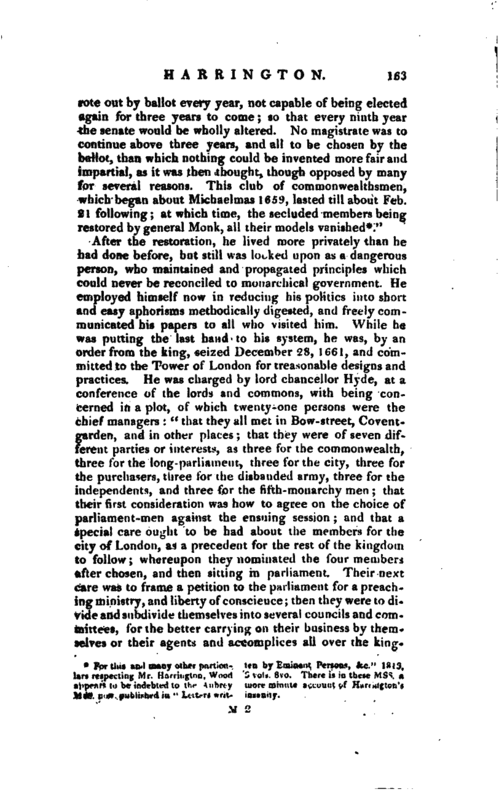 that they had taken an oath of secrecy, and concerted measures for levying men and money.” The chancellor added, that though he had certain information of the times and places of their meetings, and particularly those of Harrington and Wildman, they were nevertheless so fixed in their nefarious design, that none of those they had taken would confess any thing, not so much as that they had seen and spoken to one another at those times or places. But, notwithstanding these declarations of the chancellor, it is certain, that this plot was never proved, and was probahly imaginary. 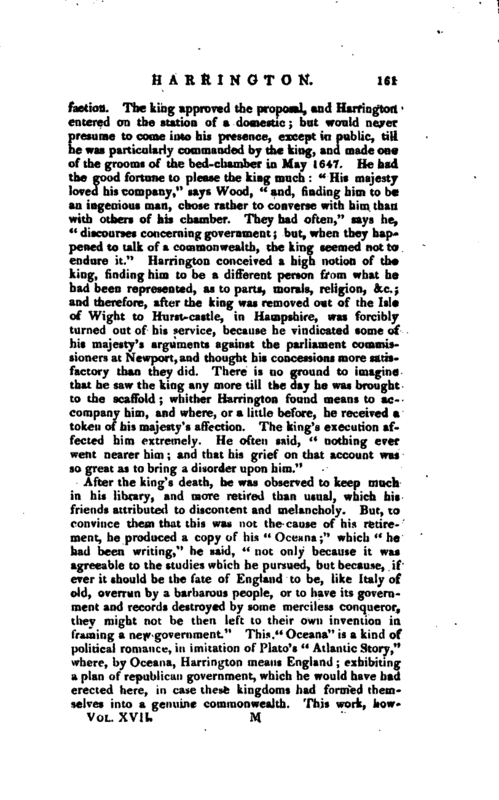 It is at least easy to account upon political principles, for Harrington’s confinement, and the severe usage he met with, when we consider not only his notions of government, which he every where enforced with the greatest zeal; but also how obnoxious he made himself to the powers then in being, by his treatment of the Stuart family. 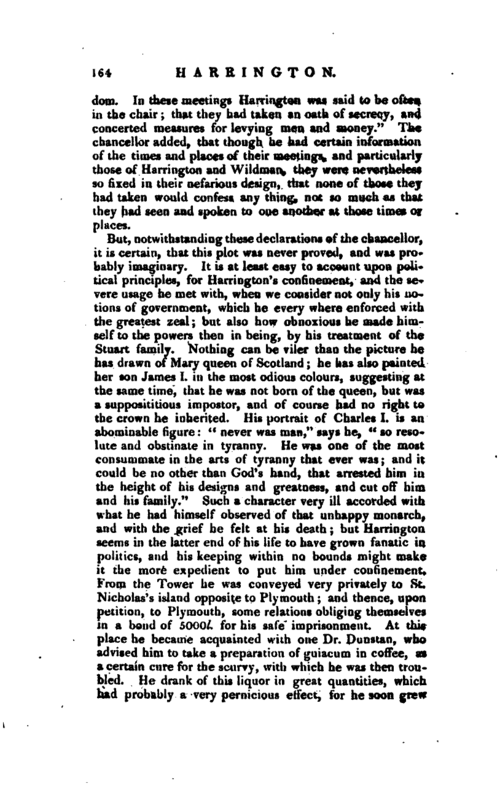 Nothing can be viler than the picture he has drawn of Mary queen of Scotland; he has also painted her son James I. in the most odious colours, suggesting at the same time, that he was not born of the queen, but was a supposititious impostor, and of course had no right to the crown he inherited. His portrait of Charles I. is an abominable figure t “never was man,” says he, “so resolute and obstinate in tyranny. He was one of the most consummate in the arts of tyranny that ever was; and it could be no other than God’s hand, that arrested him in the height of his designs and greatness, and cut off him and his family.” Such a character very ill accorded with what he had himself observed of that unhappy monarch, and with the grief he felt at his death; but Harrington seems in the latter end of his life to have grown fanatic in politics, and his keeping within no bounds might make it the more expedient to put him under confinement. From the Tower he was conveyed very privately to St. Nicholas’s island opposite to Plymouth; and thence, upon petition, to Plymouth, some relations-obliging themselves in a bond of 5000l. for his safe imprisonment. At this place he became acquainted with one Dr. Dunstan, who advised him to take a preparation of guiacum in coffee, as a certain cure for the scurvy, with whi<& he was then troubled. He drank of this liquor in great quantities, which had probably a very pernicious effect, for he soon grew | delirious; upon which a rumour prevailed at Plymouth, that he had taken some drink which would make any man mad in a month; and other circumstances made his relations suspect, that he had foul play shewn him, lest he should write any more “Oceanas.” It was near a month before he was able to bear the journey to London, whither, as nothing appeared against him, he had leave from the king to go. Here he was put under the care of physicians, who could afford little help to the weakness of his body, and none at all to the disorders of his mind. He would discourse of other things rationally enough; but, when his own distemper was touched upon, he would fancy and utter strange things about the operation of his animal spirits, which transpired from him, he said, in the shape of birds, flies, bees, or the like. 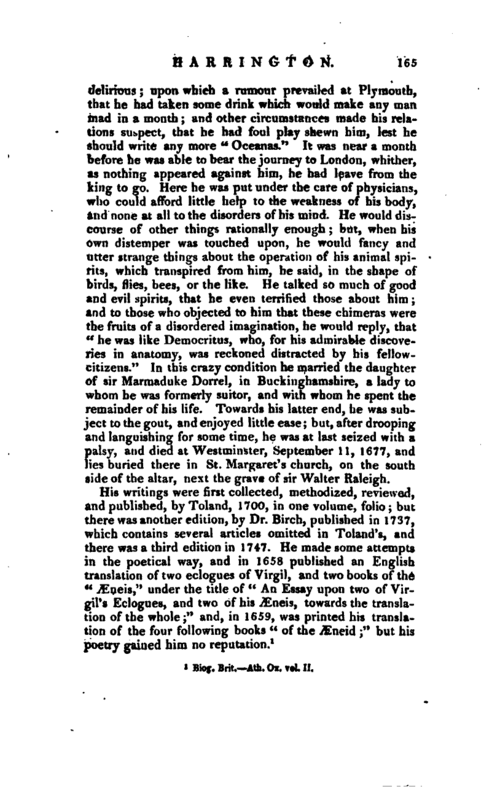 He talked so much of good and evil spirits, that he even terrified those about him; and to those who objected to him that these chimeras were the fruits of a disordered imagination, he would reply, that 11 he was like Democritus, who, for his admirable discoveries in anatomy, was reckoned distracted by his fellowcitizens." In this crazy condition he married the daughter of sir Marmaduke Dprrel, in Buckinghamshire, a lady to whom he was formerly suitor, and with whom he spent the remainder of his life. Towards his latter end, he was subject to the gout, and enjoyed little ease; but, after drooping and languishing for some time, he was at last seized with a palsy, and died at Westminster, September 11, 1677, and lies buried there in St. Margaret’s church, on the south side of the altar, next the grave of sir Walter Raleigh. Biog, Brit. —Ath, Ox. vol. II.